3 Bdrm 3 1/2 Bath Full Kitchen Sitting Dining Wifi Near To Beach, Bus Route. Welcome to Gilly’s Dream. Your home away from home. 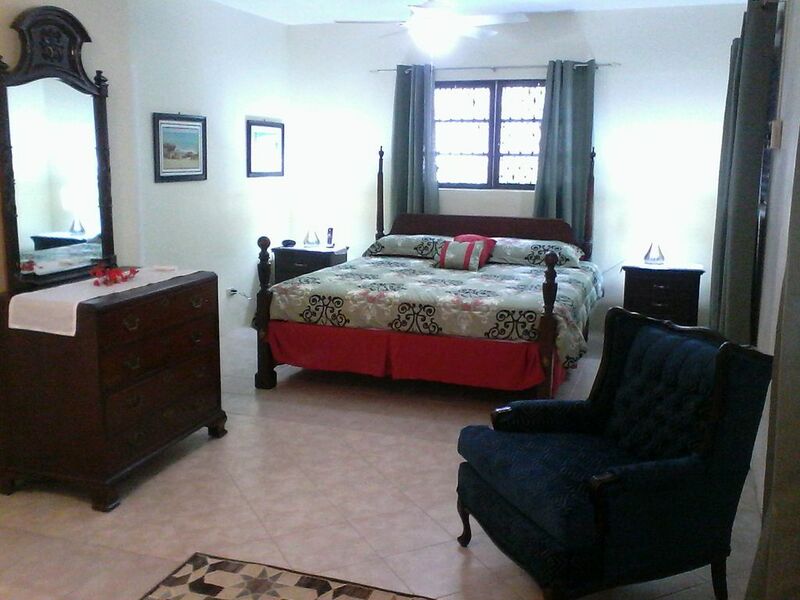 Experience real Bahamian living in the quiet and safe subdivision of Colony Village Estate. Just off the main artery of the eastern end of the island, Prince Charles Drive, you are within a very short walking distance of a shopping plaza where you will find, conveniently, a large supermarket, Domino’s pizza, Wendy’s, a pharmacy, doctor’s office amongst others. Three minutes in the opposite direction is the post office, the police station, a government medical clinic and a number of churches. At Gilly’s Dream you are less than five minutes away by car from the nearest beach. Frequent buses into the downtown area and Paradise Island (Atlantis) are caught from bus stops only three minutes away. The Mall at Marathon is three and one half miles away right along the Prince Charles Drive corridor. Gilly’s Dream is where you want to spend a real Bahamian vacation away from the hustle and bustle of a resort. Gilly’s Dream offers you comfortable sleeping for up to eight adults (in beds) with an additional 4 single folding cots. Our “Grand Room” is outfitted with one king size bed and a double sleeper sofa. “Gilly’s” is outfitted with a king size bed and “GrandMa’s” has a double bed setting. Each of these three lovely and well spaced apart rooms has its private bath, flat screen television, telephone and ductless air-condition. The general areas are central air-conditioned. Garage parking available. For groups of 6 guests or less, we are open to negotiating a reduced rate. Approach us! Retired executive from the electricity company; chartered accountant qualifying in the United Kingdom. Avid church musician and choral director. Married and father of two. Built as a "starter" home and renovated over period. Located in quiet neighbourhood. Very spacious rooms. Near to grocery store, Dominos pizza, Wendy's. Owner on same property, available for assistance as desired. Transportation assistance. Wheelchair friendly. Bedrooms individual; general areas central. Fully equipped - pots, pans, plates, cutlery, cups, glasses etc. Great experience and service for a quick layover stay. Darville was kind enough to make sure my kids safely made it to the marina while I caught a flight. We would stay again. We look forward to welcoming all our guests but especially our international guests and do our part to ensure that their visit to our island and our country is a memorable one. We again thank you, Shannon and family, for choosing Gilly's Dream for your layover. Of course, if you are ever back here in Nassau we want you to know for sure that our home is your home! Once again Jill, thank you and family for choosing to stay with us here at Gilly's Dream. We feel it a serious sense of responsibility to ensure that our guests to our home, in particular, and our country, in general, deserve the best experience. We are very aware that persons at times may have been saving for quite some time to experience that dream vacation and having chosen The Bahamas, we want to make sure that those with whom we come in contact realize their dream. So we are delighted that you had a good time here in Nassau. Of course, if you are ever back here in Nassau, Gia and Sambrianna (wife, whom you did not get to meet) and I would expect to be welcoming you back to Gilly's Dream. The house was spacious and clean, but even more impressive was the kindness and attentiveness of the hosts. They went above and beyond in their efforts to help with transportation and logistics and it was greatly appreciated. De plus, nous avons eu droit à un tour guidé de la ville. Darville nous a gentillement escorté à l’épicerie puis ensuite le lendemain à la marina. Le tout gratuitement. Darville et sa famille sont extrêmement accueillants, chaleureux et très disponibles. L’appartement est très propre et largement assez grande pour une grande famille. Nous avons tous adorés notre cour passage chez vous! Nous allons très fort probablement nous revoir :-). Je recommande cet endroit sans hésiter ! Thank you, Melanie for your very kind review. Gia, Sambrianna and I were truly delighted to serve you and family. We do our best to ensure that our guests have a memorable stay with us, whether a brief or extended one. Of course, if you are ever back here in Nassau, please know that we would be looking forward to welcoming you again. We trust you had a very pleasant sail through the Exumas. Our best regards to all! On our recent trip to the Bahamas our group stayed at Colony Estates. The owners met us and were such pleasant people. A tour of the property was the first order of business before our group of 11 settled in. The residence offers 3 bedrooms with 3.5 baths. The residence is spacious and comfortably appointed, one sofa bed and several air mattresses to accommodate large groups. A shopping center is just a few blocks away if your group chooses to dine out or prepare meals on site. Great value and a hidden gem in Nassau. Thank you again, Cindy and party for choosing to stay at Gilly's Dream on your visit here in Nassau. We really cherish the opportunity to welcome our guests to the home in particular and to Nassau in general. We do our best to ensure a memorable and comfortable stay. And we are fortunate to be conveniently situated for the food stores and other services. We appreciate the reciprocal warmth and friendliness displayed by your party. Of course, if you are ever on a return here to Nassau, please do know that Gilly's Dream here in Colony Village Estates is your home-away-from-home. Darville and his wife are fantastic people, which I think goes a long ways in being confident that you are in good hands at this house! Had a group of 12 and there was plenty of room, house cooled down quickly with a/c, wifi was great, and there is pretty much all you need to feel right at home. Neighborhood is nice, felt totally safe . . . you will need a car for sure, but we were there to explore and experience the island so that was no problem - drive to Nassau is about 20 minutes, and I'd suggest heading east down to the coast and then driving in that way - less traffic and more scenic . . . store and dominos a 10 minute walk away too. Thank you so much, Brock for your stay and your kind review. We do our best to help our guests experience a comfortable stay and particularly enjoying a sense of feeling secure and safe while here with us. Yes, if you want to move about totally unfettered, a car is recommended. However, with bus stops no more than a three minute walk away, one wanting to use public transport can readily do so. Also, we do offer an in-house service for groups up to 7/8 persons. We commend your group of young people who deported themselves very well. We were most pleased to have your group with us. Of course, if you are every back in Nassau, know that our doors are open and ready to welcome you again. We wish for you a productive remaining academic session. Quiet residential area, on eastern end of island, 3 minutes' walk to a main artery road, bus stop, supermarket, convenient movement into downtown, Cable Beach and Paradise Island.